France: What does the “Up All Night” Movement Signify? What does the “Up All Night” Movement Signify? [Further reflection by some comrades in France on the political situation there to go with a previous document on the struggles – See leftcom.org]. The ICT position is in the document on the site "France: A New Attack on the Working Class". Irrespective of the use and abuse of "Up All Night", this phenomenon is a sign of a subterranean journey of some reflection and of the need to struggle against the seriousness of the political, economic, social, ecological, and other situations within sections of the working class, including unemployed youth in the process of proletarianisation etc ... "
The importance of the content of the expressed concerns. Whatever manoeuvres orchestrated around Ruffin, the anti-globalisation economist, Lordon and others, who have driven and continue to sustain the street rallies, the continued existence and content of the concerns expressed there show that "Up All Night" is (not always, but often) the authentic place for discussion about class issues that are just as fruitful as those that take place during demonstrations and in strikes, occupations, or blockades. - its quest for a way to fight and oppose the new attacks against workers. - being the first action for a long time that is trying to stop the widespread offensive of the bourgeoisie against the workers that has lasted for at least twenty years and, in this sense, it is the first attempt to regain the initiative in the streets against the steamroller of the all-conquering capitalist class. - the existence of a extraordinary storm against all the political, economic powers-that-be, etc .. including the media and the false democracy that is imposed on us. - The beginning of a challenge to the political manoeuvres of the various hidden elements within the "Up All Night" movement itself. This is quite apparent and shared in many debates especially in some of the "popular education" forums. There is disappointment, mistrust, hatred and some also against "false friends" who are trying to manoeuvre it down blind alleys. - dispelling the leaden atmosphere on the streets of post-bombings Paris. These assemblies have so far given a response and have rejected in action "the false democracy that has been imposed on us", at the same time undermining in action the false “national unity” against terrorism which has been burning in our ears since the attacks in January this year and in November, 2015. The first lessons to draw from this movement and the mobilisations that will certainly continue and go on in other forms. - Social struggles are returning to the top of the agenda (something we have not seen since 2010 in France) and a halt to the atmosphere of "national unity" against "terrorism". - The development of "public speaking" by everyone, and the widening of concerns beyond the “Labour” law alone to that of wider social perspectives. Although "public speaking" is not enough in itself it allows the collective to find ways to understand and act. This is absolutely necessary for any perspective for struggle and extension of struggles. Contrary to those who think that the assemblies that have resurfaced several times in recent years (you could say "the movements of the Squares" - Taksim, Tahir, Wall Street, Indignados ...) are mainly the expression of "democratic illusions" and of "manoeuvres against the working class" or that they are "interclassist" places, they are the product of the needs of the struggles and for debate in the working class. They are particularly important in a context of massive unemployment and the current globalisation which has so badly pulverised previous conditions of class struggles, especially in the "places of production" of "the working class". The composition of the participants in "Up All Night" is not the "petty bourgeois wage workers" (as certain groups now theorise) but mainly elements of "the working class", even though its protagonists do not conceive of themselves as such. And this type of gathering also has the merit relative to "workplaces" to question sectionalism and corporatism, giving encouragement for us to go beyond them, to develop solidarity. Although these mobilisations will eventually dissolve in the coming days, they already deserve to have some lessons drawn from them for future struggles. 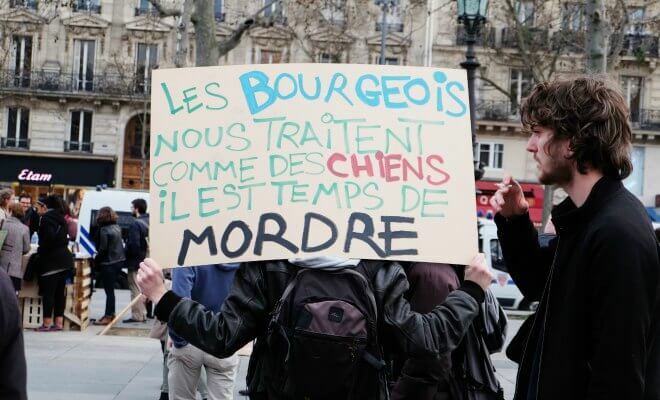 The slogan on the picture says "The bourgeoisie treats us like dogs - its time to bite them"